NIMA Brush is an Irish professional Makeup Brush company specialising in Professional Make Up Tools & Accessories. The company was established by long time Irish makeup artist, Niamh Martin, who has over 15 years experience of working as a professional within the Irish and UK beauty industry, as well as numerous years of teaching experience. Niamh’s aim was to provide fun, professional, and affordable tools to enable both professionals and non professionals alike to invest in high quality makeup brushes for their everyday makeup application needs. NIMA Brush are manufactured using the most natural fibers and strongest brush ferrules. This will ensure your make up brush not only lasts for you, but is of the highest professional grade. Something else you may notice about Nima Brush is that they are instantly recognisable. The Nima Brush collection has also won a number of awards including RSVP Magazine’s ‘Best Makeup Brushes’, U Magazine’s “Best Makeup Brushes’ and RSVP Magazine’s ‘Best Travel Set’ went to Niamhs latest creation, The Girls on Tour travel set from the Artistic Collection. 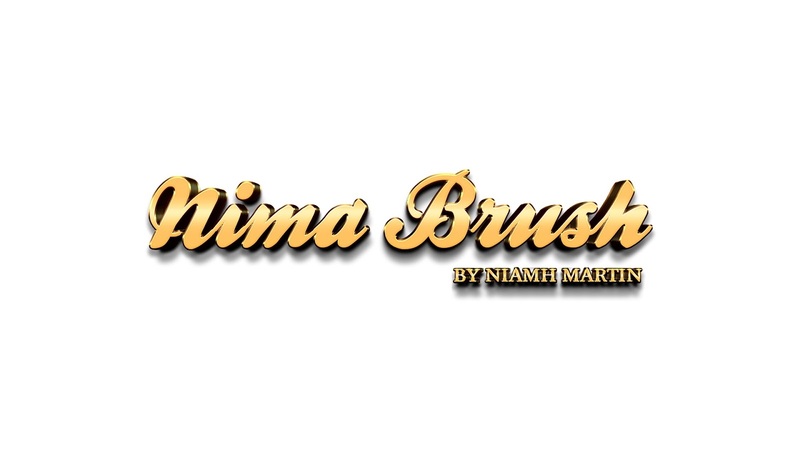 Nima Brush has also been featured on Xpose and Ireland AM by some extremely influential beauty professionals. Nima are a brush brand which I love. I have about 15 of their brushes now and I love them. They are a very affordable but high quality brush. I have my favourites such as the flat head kabuki, the Nichola, The Caroline, The Jennie. Aswell as these I have the Kabuki Contour Set and the 5 piece Eye Set. I am very excited about the Christmas Box Collections which is their first ever Christmas collection. 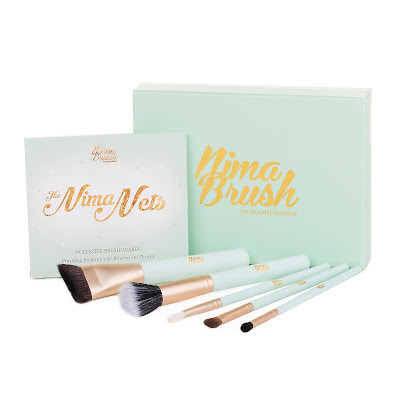 This collection is great value, contains 3 brushes, a Nima Mitt and the Nima Brush Egg. It retails at €30 and is worth €49 euro. The brushes included are the Karen, which is a Retractable lip brush. But with a flat tip! Can also be used for detailed eye or brow work. The Emma a concealer brush. Use this brush to softly pat concealer onto the inner corners of the eyes or onto any blemishes on the face. The Erin Fan Brush – smaller than the traditional fan brush to create more precision in application. This brush has many uses such as highlight, sweeping away any shadow leftover, or even shade under the cheekbones. This collection is super value, contain 5 brushes, and the Nima Nets. It is a beautiful set for anyone who is looking to build up their brush collection. The brushes included are the Liposuction Leah which is used for precision powder, contour, blush and highlight work. The Jane which is a duo fibre brush used for foundation, The Jennie which is used for to apply transition colours into the socket line of the eye or to quickly and seamlessly diffuse out shadow for a perfectly blended finish, The Lauren designed for use along the Contour or socket line of the eye. The Aoife this brush is perfect for use both on the upper and lower lid of the eye, this brush is the perfect length to both smudge and blend. This eye shadow brush can be used to naturally smudge shadow liner and for blending socket line colours for more intensity. The Nima Nets keep your brushes in shape and hygienically clean and safe while travelling. A gorgeous contouring set made up of 7 Nima Brushes, including our bestselling ‘Terrie’ brush, that will take you from start to finish with the most beautiful and perfectly sculpted look. Whether it’s cream or powder contour, whether it’s face sculpting or Eye sculpting, this set will cater for any look you want to create. Comes presented in a gorgeous gift box complete with a Nima Mitt, Nima nets and a brush egg. The brushes included are the Terrie is a miniture version of our ever popular Flat Head Kabuki can be used for powder or cream/liquid products.This brush is best used for a more precise foundation application or for buffing out concealer under the eye or on smaller areas of the face. The Suzanne is extremely versatile and can be used for a variety of different applications such as foundation, concealor application, highlighing the raised areas of the face, for a light sweeping of cream blush on the apples of the cheeks and can also be used to create a soft shading effect to the contours of the cheekbones. The Blaithin a domed pony hair brush which can be used to either apply blush to the apples of the cheek or to shade or highlight areas with the fine tip. The Kate a small detail eye brush made with the softer synthetic fibres that applies powders, liquid and cream eye shadows with a light, sheer touch. The Donna Use this brush to apply shadow to the socket line of the eye and also to quickly and seamlessly diffuse out shadow for a perfectly blended finish. The Lucy is the perfect detailing brush for so many areas. It may look small bit this brush is not to be underestimated!!! Add the perfect carve to those brows, clean up and sculpt around the perfect lip line, smudge out the upper or lower lashline and create or carve out the most flawless winged liner. The Stephanie a pointed eye liner brush which can be used for creating defined liner looks. This is the ultimate collection. It contains 10 of the best selling brushes in one set. The flat head kabuki, the Leah and the Harley will change the way you apply your makeup on a daily basis. These multi purpose tools will cater for any look from the most simplistic to the highly dramatic! An array of detail brushes will help design any look you’ve ever dreamt of! Presented in a stunning magnetic gift box with a set of Nima Nets, a Nima Mitt and a brush egg to top it all off. The brushes included are the Harley The ‘Harley’ is a face brush extremely versatile and can be used for a Variety of different applications such as highlighing the raised areas of the face, for a light sweeping of blush on the apples of the cheeks, bronzer application and can also be used to create a soft shading effect to the contours of the cheekbones. The Leah this brush is Multi use and can be adapted to use in many ways. Cup the cheekbones in the rounded groove of the brush to get the perfect blush application, work on its side to sculpt out those cheekbones or use the tapered tip to get the perfect highlighting tool for delicate areas. This is a one stop shop for a perfectly sculpted face. The Mise is the perfect brush to define and create precision lines. This Angled Brush is ideal for eyebrow and eyeline definition and for sharpening beneath the eyebrow and around the lip with your foundation. The Emma a concealer brush. Use this brush to softly pat concealer onto the inner corners of the eyes or onto any blemishes on the face. The Yvonne with its fine tip and and the nylon bristles enable a professional application with gel eyeliner, cake eyeliner and eyeshadow. Perfect for creating that perfect feline flick. For use on upper lashline, the wet line or for lower lashline shadow application. The Lauren is designed for use along the Contour or socket line of the eye. The ‘Selfie’ brush is that perfect shape for both pressing shadow on to the lid and also blending out the socket line. It blends shadows seamlessly leaving you with the softest contoured eye. This brush will professionalize every eye makeup making it suitable for all users. The Belle is the perfect brush to softly blend any transition or socket line colour. Whilst this brush looks too big to get into those smaller areas, once you touch your skin with the ‘Belle’ you won’t believe it’s softness and precision. The Karen which is a Retractable lip brush. But with a flat tip! Aren't these the most wonderful Christmas collections. These are ideal for anyone who is building their brush collection or who like me just loves adding more brushes. My eyes are on the Naughty but Nice set. Available online here . There are many Nima retailers out there also where I am sure you can avail of these sets. I know in Waterford we have Sue from Brush Beauty and also the ladies in Queen have some brushes available.